There are so many concepts that you can apply to your interior design, to ensure your kitchen is inviting and cheerful. As Canadians, we know how important it is for our kitchens to be the heart and soul of the home, especially in the cold winter months. As we start 2017, let's work out how we can make it even more so! These 10 beautiful and lively kitchen decor ideas from around the world are sure to inspire you. 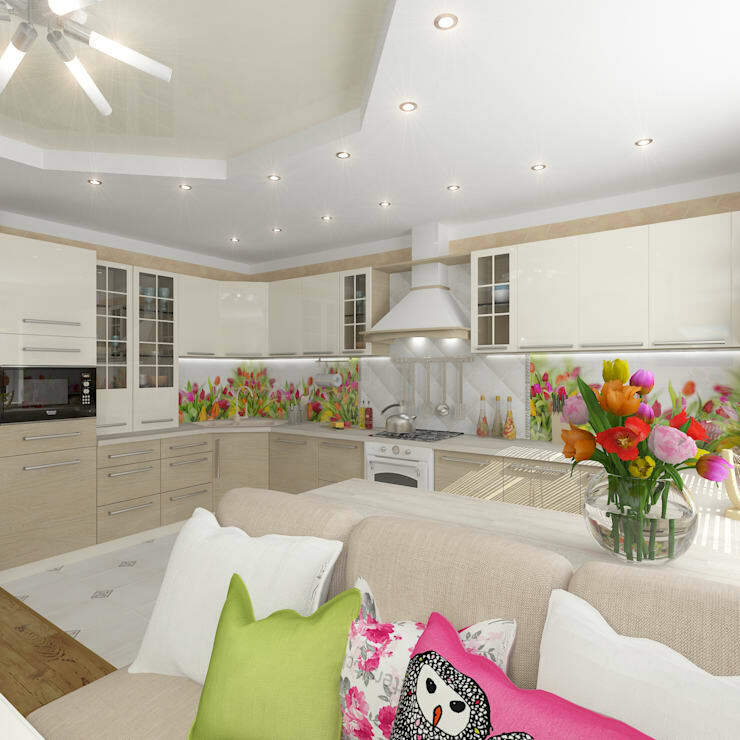 Our first example is an open kitchen design with light tones and gorgeous floral decor. The L-shaped cabinets make for a very spacious kitchen. The main feature of the bright, spacious-looking kitchen with the soft ceiling lights and light tones, however, are the floral tile walls. The beautiful fresh arrangement of flowers on the dining room table emphasizes this refreshing and natural form of decor even more so. 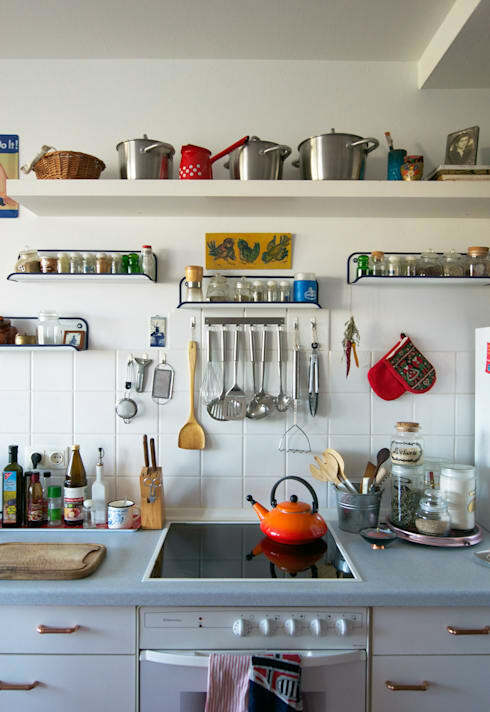 One of the ways you can cheer up the kitchen is to install open shelves. Here you can keep all of your colourful cups and plates on display, while still keeping them neatly arranged and organized. Instead of the dull design of closed kitchen, cabinets, go for this option. Have a look at these things to consider when choosing shelves for inspiration. Wallpaper used to be quite fashionable and once again, we are seeing it as a top trend. While wallpaper is more commonly used in bedrooms and living rooms, it can also create a gorgeous look and feel in the kitchen, as we can see in this image. 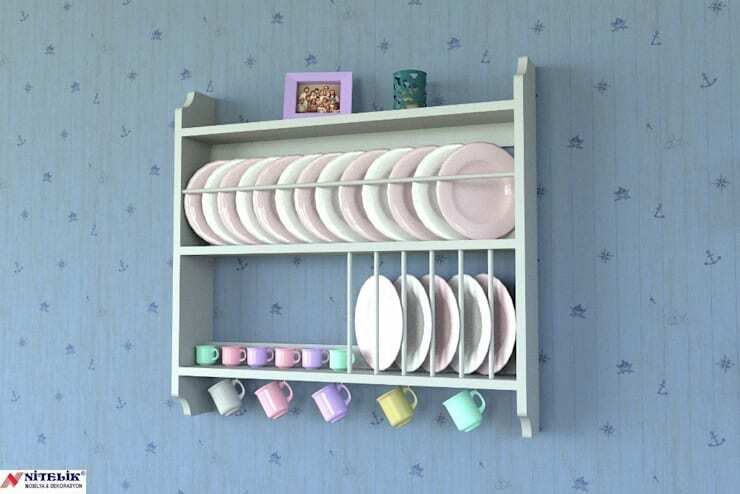 Use it it create a very stylish and eye-catching form of kitchen decor. 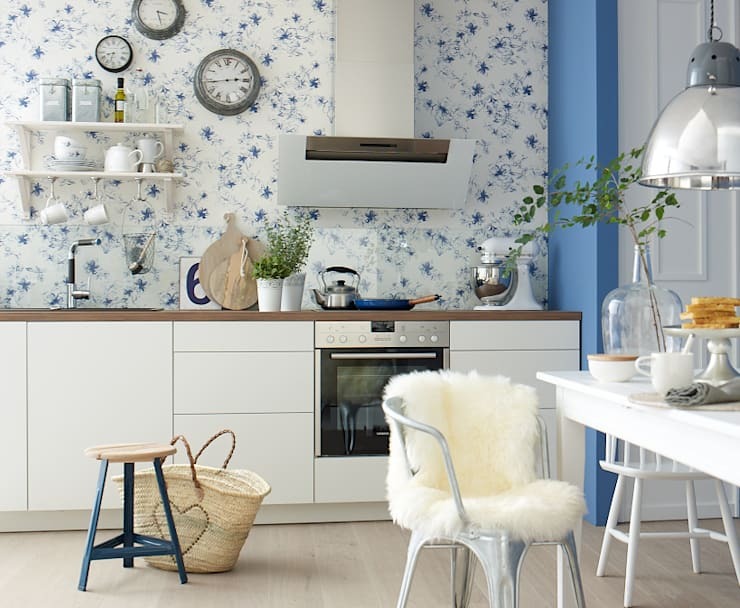 Don't you love the blue floral pattern on white in this kitchen, which makes the whole space warm and inviting? Especially for those who live in the city center, who don't often get a chance to connect with nature, this can be a great tip. 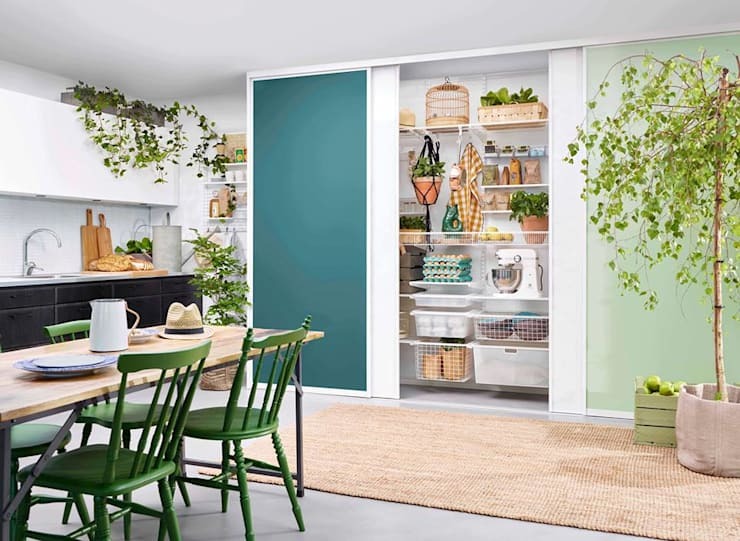 Create your very own interior garden in your kitchen but adding pot plants or even a vertical garden. 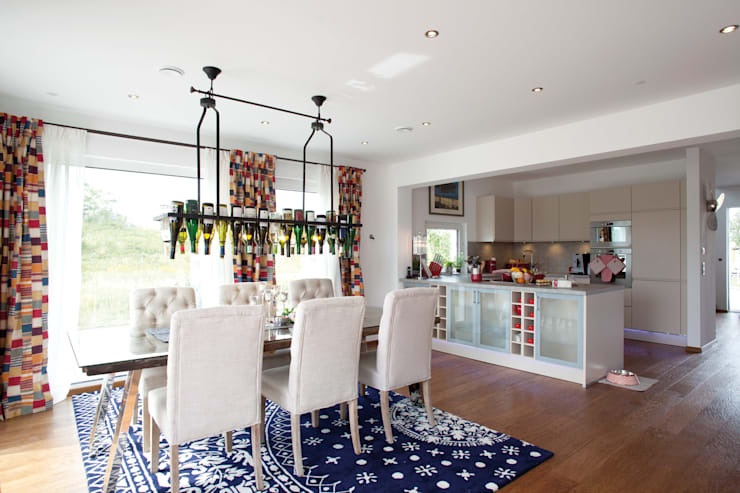 As we can see in this kitchen, it can be a very inviting and inspiring design! Every home has a kitchen at the heart of it. The simplest way to add vitality and joy to it is to add colour! However, you don't have to go the usual route and paint the cupboards. In fact, for more creative solutions, you should use paint in more unusual places. 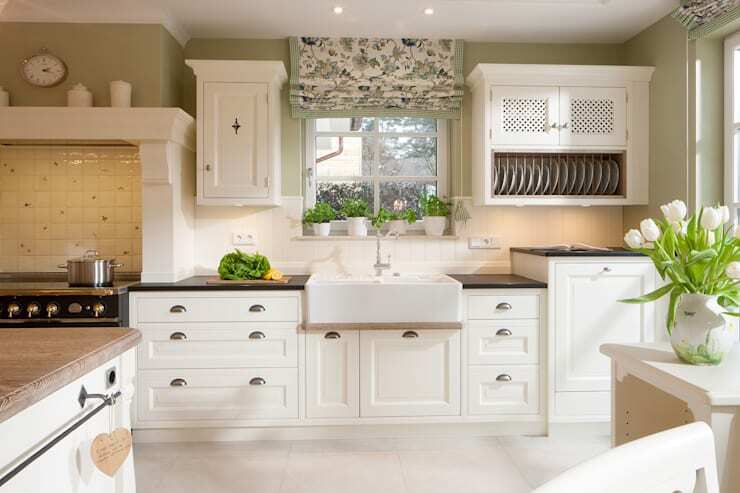 For example, in this design, the wooden cabinets are a simple and plain white while the walls are painted a dark red. 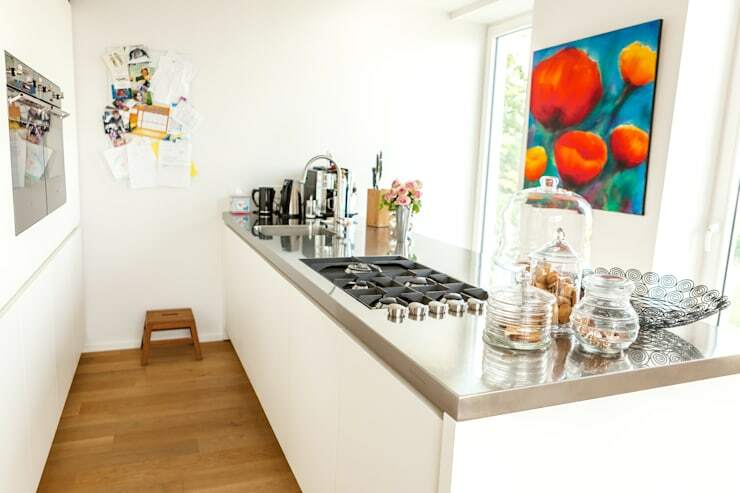 In addition to this, the wooden counter tops have been painted in colourful, thin strips. This is a very creative result that is incredibly warm and appealing. If your kitchen has a very simple design then use your textiles to add a bit of colour, texture and pattern to the space. Introduce patterned cushions, colourful curtains or a bright table cloths. You can also use kitchen utensils to bring function and trend into your kitchen design. Set a specific concept or theme, like these designers have done. Here they have gone for a vintage look and feel, using every functional element – even the appliances – to reinforce the theme. If you are going to buy a house from scratch or build a kitchen from scratch, take advantage of the windows. Windows can not only enhance the look and feel of the kitchen, as we can see in this image, but they allow natural light to flow into the interior space. 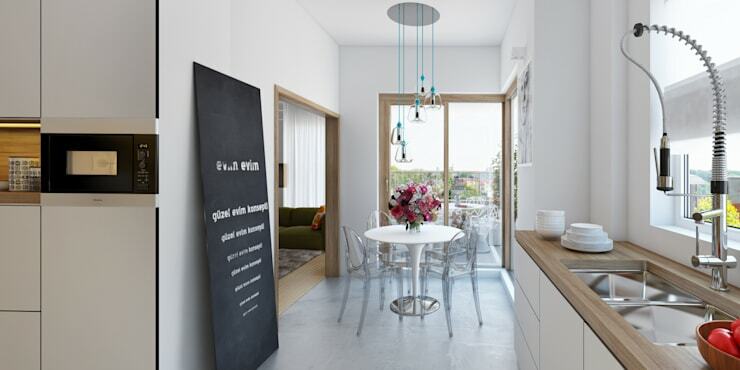 This makes for a modern, bright and spacious design. Use little flower pots on the window sill to bring life and soul to the window. This example introduces a very unique concept. The simple white washed kitchen is plain and minimalist, with a silver counter top and only the most functional of elements on display. However, a beautiful and bright flower artwork attracts attention and becomes the focal point of the space. Introduce some personality and charm to your kitchen with a piece of artwork that speaks to who you are. We often just think of the most basic furniture for our kitchen, such as cabinets and counter tops, but why not furnish this area with a little table and chairs? You can also use your little table and chairs to decorate the space. Place a fresh bowl of fruit or vase of flowers on the table or a bright table cloth. If you've enjoyed this article, you'll also love these 8 clever ways to improve storage in your kitchen.